A healthy, simple homemade guacamole recipe that is easy to throw together for one, or for a crowd! 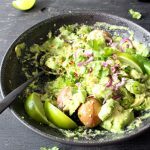 Perfectly ripe avocados loaded with healthy fats, lots of flavor and a chunky rustic texture, makes this the best homemade guacamole dip you’ll find yourself making over and over again. The secret lies in finding the perfect balance between the acidity from the limes, the sea salt and the spiciness of the peppers. Yes, you can definitely make it without cilantro, but If you want to stay authentic you really want to keep it in there. It is lovely! 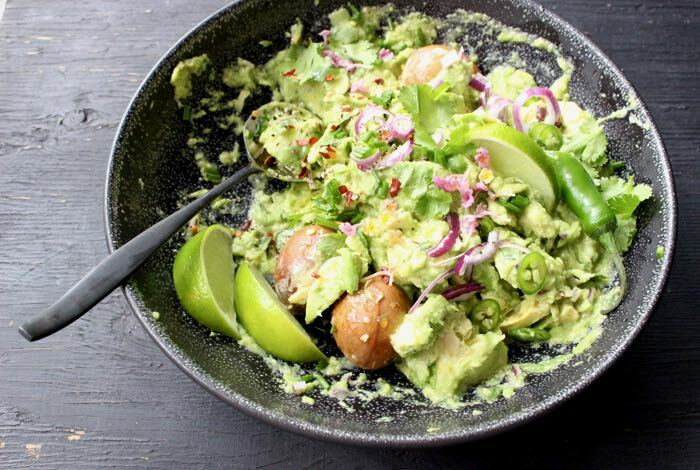 To attain that rustic chunky texture just scoop out the flesh out of the avocados, pile all your ingredients into a large bowl and gently fold to combine. Easy, right ? Scoop it over these shrimp tacos or serve with chips and salsa, fresh tomato salsa, black beans or sour cream on the side. Note worthy: To keep your guacamole from browning or oxidation, throw a couple of the avocado seeds in the bowl. You could even layer a few lime or lemon slices on top before covering with plastic wrap, the acidy will keep it nice and green, like magic! A simple, healthy homemade guacamole recipe that is easy to make at home for one or a for a crowd! Cut the avocados in half lengthwise and remove the seeds. Reserve a couple of them. Inside the shell cut the avocado in half lengthwise. Using a spoon scoop out the avocado from its shell and transfer the flesh to a bowl. 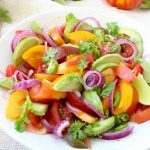 Add the green onion, red onion, chili pepper, lime juice and cilantro to the bowl with the avocado. Drizzle with the olive oil and gently fold together. Season with sea salt to your taste. Adjust seasonings with more sea salt and lime juice and taste again until happy. Garnish with the snipped chives. 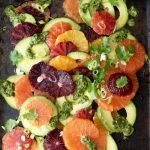 Serve it with fresh tomato Salsa on top, or cover it with thinly sliced lemons or limes to save for later and prevent browning. Make sure you use tight plastic wrap on top before refrigerating. 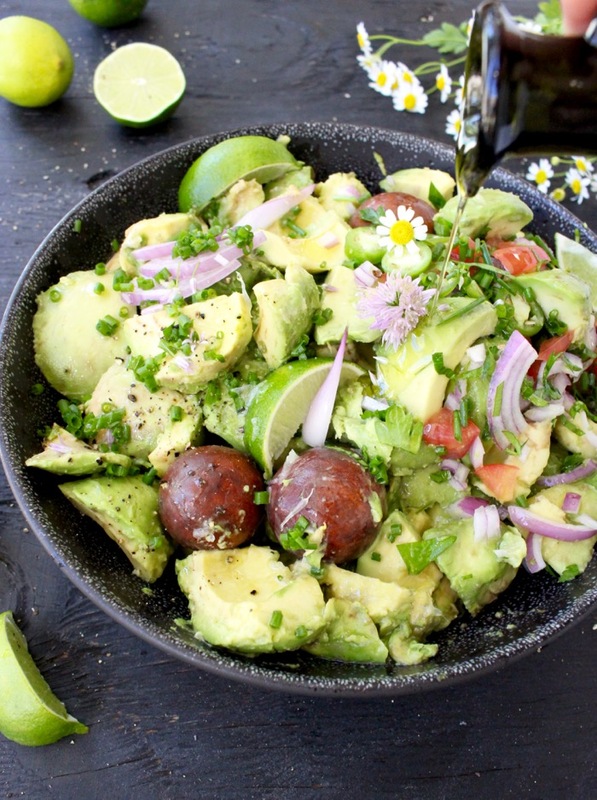 I really do love how you left the avacado pieces thick and chunky for this gauc! It’s almost like a salad to me! You can do so much with this recipe. My tummy is screaming – “where the shrimp at” lol. Looks great! YES. Leave that plastic bag guac alone! Fresh and From Scratch is ALWAYS better. This looks amazing! Thank you Tracy, always from scratch 🙂 Happy Sunday ! Thank you, thank you!! I’ve been wanting an easy guacamole recipe for the Super Bowl. This is a definite inclusion — I don’t like football the the snacks are great!! Wow, have never heard of the trick with the avocado seed to stop browning before – trying that with our next batch. 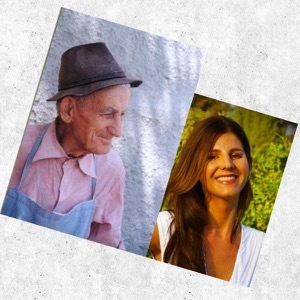 Your version looks great – perfect! Yes it really works, and make sure to layer thin lemon slices over the top as well. The acid prevents the avocado from oxidation. I love guacamole and looking at this made my mouth water. I have to try your recipe. Yes, you have to ! Guacamole for everyone ! Homemade guacamole on toast is breakfast for me ! Lol, I know what you mean ! This looks delicious, I never tried to make it but you made it look so easy I’m going to try it! We love guacamole so much! It is always fun to try different variations like this one. Guacamole makes everything better! I love it on everything too! This is a fabulous recipe! Me too, I just made some sweet potato sliders and topped them with this guacamole, it was an instant hit. I better hurry and post that recipe! Wow, this recipe looks delicious. I’d love to try it out for a dinner party or maybe a football game! If you have 5 minutes, you got a simple guacamole ready to go ! Win-win! Funny story, I hated guacamole before I became pregnant with my daughter. 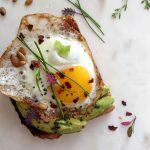 During my pregnancy, that was one of my biggest cravings! Now I can’t get enough! I need to try this recipe, it looks amazing! Haha, funny how life works. I used to hate cilantro, now i can’t live without it ! Go figure! We’re a big guacamole family here and love it regardless of how it’s made! This variation sounds absolutely delicious 🙂 The best thing about quac is it’s SO versatile and good for you to boot! Yes you can really indulge and not feel guilty. My kind of snack ! 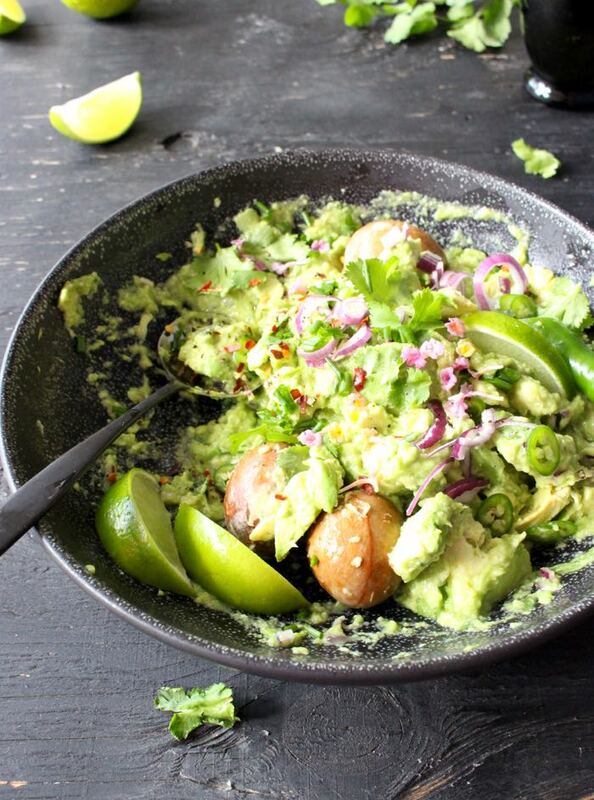 We love guacamole around here and find that it is especially great on game day. I like that your recipe uses two types of onion. Thank you, I love a little texture from the red onion and more sweetness from the scallion to balance it out. This looks like a great recipe for guacamole. I have not made it myself yet but want to give it a try. I do not like it when it is too smooth like a puree, like that you made it chunky. 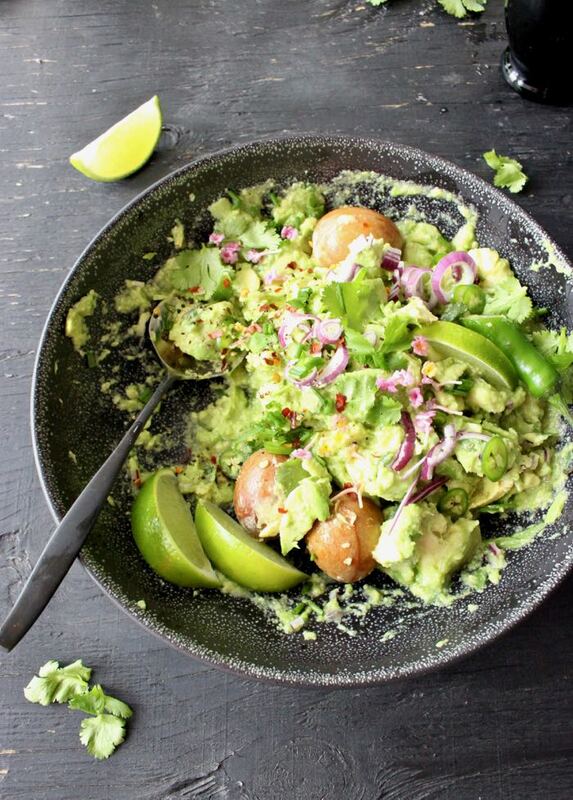 Texture is everything in guacamole. Simple but good, hope you try it ! I love a good guacamole recipe. This one looks similar to one I use…it’s so tasty! I’ll have to give yours a try. Report back if you try it ! I love guacamole! Those are some incredibly appetizing photos! Yumm! I love guacamole and your presentation looks so delicious. With that said, I can’t wait to try your recipe. Thanks Janis, have a great weekend ! Nothing better than fresh homemade guacamole! Yours looks fantastic! Pinned! I agree, I could eat this for every meal ! 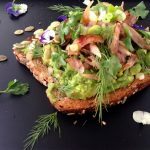 LOVE homemade guacamole – it’s so easy to make but tastes so, so good! I have never had much luck with making my own guacamole. I will have to give this a shot and see if I can get it right! I know you can do this Becca ! It is a simple guacamole recipe, you can’t fail. thank you, so glad you enjoyed it! We love guacamole around here !